INTENSE TALKS HAVE been taking place between the Housing Department and Department of Public Expenditure and Reform in recent weeks to determine what level of funding can be given to the mica redress scheme. It emerged a number of years ago that the mineral muscovite mica was present in many concrete blocks used to build a large number of properties in Donegal – and some in Mayo. Homeowners only discovered the mica contamination when large cracks began to appear inside and outside their homes. Lots of the properties deteriorated very quickly, with many already condemned. Some owners have been forced to move to rental accommodation while still paying off their mortgage. For close to 10 years, homeowners impacted by the mica housing scandal have campaigned for their homes to be repaired. It was estimated that as many as 4,800 dwellings in Donegal and 345 homes in Mayo are affected. Last year, Cabinet approved a new redress scheme to help homeowners repair the damage, but little has happened since. 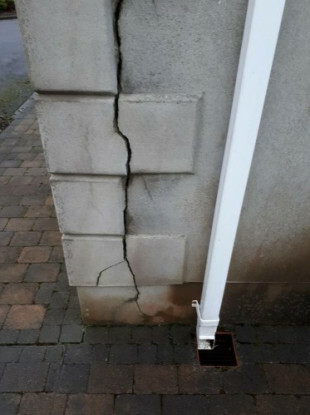 Families have said further damage to their houses has become apparent following extreme weather. Campaigners are further concerned that the cost overruns of the National Children’s Hospital could impact on the level of financial help they might receive. Fianna Fáil’s Charlie McConalogue raised the lack of progress with Minister Eoghan Murphy this week. He said in many cases, peoples’ homes “are crumbling around them”. “This is something the government promised as far back as the budget last year. The delays we have seen over the past number of months are simply unacceptable. The government really needs to get its act together on this and publish this scheme immediately so that we can see houses being remedied and families taken out of the distress and misery they have been experiencing as a result of having this unfortunate situation,” he said. Murphy said he appreciated the deputy’s patience and the patience of those impacted. He said it will be brought to Cabinet as a priority, once all is agreed. It is understood that while the roll out of the scheme is in its final stages, discussions about the level of money required is still ongoing with the Finance Department. The housing minister is understood to be awaiting final sign-off on the deal by DEPR. “We have agreement in principle. We made that agreement at Cabinet level at the budget. My Department and the Department of Public Expenditure and Reform have been in intense discussions since then and in recent weeks over what that scheme would look like, and that is almost complete, and also the amount of funding that could be put to it in the initial years. That work is almost there. When it is there, it will be brought to Cabinet as a priority,” he said. Email “Mica scandal: Families living in 'crumbling homes' as redress scheme awaits sign off”. Feedback on “Mica scandal: Families living in 'crumbling homes' as redress scheme awaits sign off”.